ERM or Enterprise Resource Planning is an internal management system that collects, synchronizes, analyzes and helps in defining strategies by integrating various in-office departments and levels and by gathering all the associated and independent information of the present business condition. With all these information combined, data-driven strategies are made that helps the company to take forward with scientific mission and automation. CRM or Customer Relationship Management is an A to Z system software for maintaining customer relationship or front-end business. This customer relationship management encompasses from periodical customer communication, content circulation, scheduled communication to sales management, product management and evaluation, workflow management, and other direct-selling factors. Why are ERP and SALES SOLUTION often considered in one go? ERP and Sales Solution, though both are very different from their respective set of features and objective, broadly complete the circle of business. Where ERP takes care of the in-house production quality by working like a bridge among the internal departments; CRM mostly takes care of the sales, circulation, marketing, and the overall customer communication. So basically, what ERP does for the in-house departments, Sales Solution does for the front-end business. Therefore, with a complete ERP-CRM solution, you have increased sale channel, better employee management, better customer retention, minimized in-between project meantime and accurate product and profit forecasting. The circle: As previously said as well, ERP and CRM complete the circle. ERP takes care of the ROI increasing, manufacturing ease and better sales where CRM builds a strong network, customer satisfaction and increases client reach; both the systems with an end goal of more profit. ERP and CRM together work brilliantly well for Market Automation as well. Brand Awareness and Visibility: Integrating Sales Solutions into Manufacturing ERP helps an organization to sync between customer accusation, sales qualifying, brand awareness to manufacturing process and challenges, customer review, logistic details, account standing etc. so basically, it creates a chain of good marketing-good service/product-quality customer experience-customer retention and increases. With the help of Sales Solution or CRM Software, the employees will get a real-time update of the customer trend; sales trend and overall business growth that will help them to a great extent to produce a quality product. Also, the other way round, if the front-end employees have a clear idea regarding the back-end manufacturing, customer communication would be much more instant, spontaneous and helpful. Better accuracy and efficiency: Take a real-life example of how CRP and CRM individually work in a system flow. When a customer will be sales qualifies and would order something to make a purchase, all the customer related information will then go to the CRM or Sales Solution system. Once the order gets confirmed and for that particular order, the back- office employees need to work on that delivery, then the back-office respective person will re-enter the data taken from the CRM system to the ERP system. 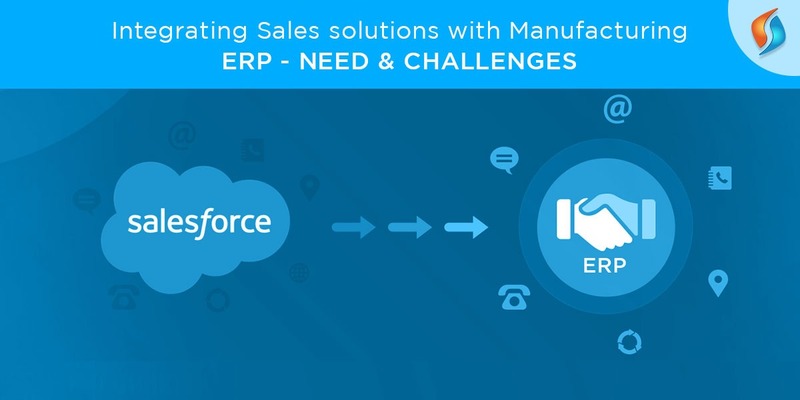 If the Sales Solution system is integrated into the manufacturing ERP, one single entry at the very first will work through the entire manufacturing flow. And it goes without saying that the less number of manual entry, the more probability of accuracy. Also, it reduces ‘data duplicity’ to a great extent. This system can be initiated from the ERP system as well. For example, if the Manufacturing ERP department increases a particular product’s price, the front-end CRM operators can instantly get to know about the update and can take forward the client serving accordingly. This integration dramatically deduces the in-total production time, induces data-driven future action plan, improves customer serving with auto-generated past records, helps in proper resource allocation, a proper ration between strategy making-manufacturing. You must be thinking who the sloths that still have not intergraded Sales Solutions with ERP are? Mutual agreement between the company and the third-party service provider on all the software, services and support that are going to be involved. Sharing of existing data from one department to another till all the departments have a standardized summary of all the records to date. Before starting off, clear all the irrelevant and outdated data from both your existing ERP and CRM system. New and relevant data can be reused but they need to align with the new system, of course. You know what the benefits are; you know what the challenges are; we’re there to help you out. What more you need?